As you may have noticed, I’m a big fan of colour: colour-blocking, clashing, accenting, flashing, indeed a veritable riot of colour is what I feel most at home wearing. So much so, that this is one of my more conservative outfits (although today my bleached white-blonde bob does have additional pink streaks in it, thanks to Kevin Murphy’s wipe-on-wash-out Color Bug)! 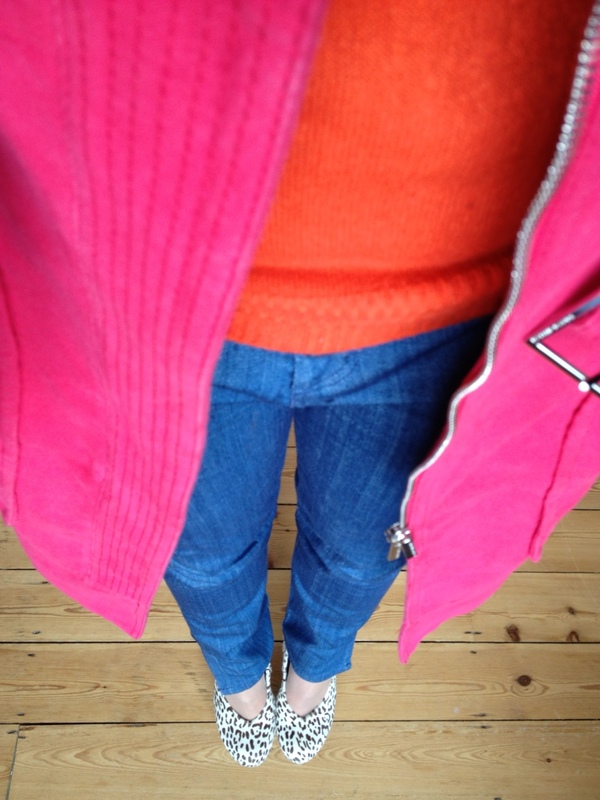 My hot pink 3/4 length coat is from Karen Millen, the skinny, high-waisted, zip-flare jeans are from the 1971 Reiss range, the orange jumper’s from Primark, and the leopardprint platform ponyskin shoes are by Deena & Ozzy courtesy of Urban Outfitters (see previous post). High Street heaven!